Award winning Australian documentary filmmaker Mario Andreacchio is no stranger to crafting feature films about talking animals. Yet unlike our current obsession with dancing or zoo animals who like to "move it, move it," in his 2006 work Elephant Tales which premiered at the Tribeca Film Festival, he goes against the popular formula of animated characters just waiting to be stuffed and sold in a local toy store or dished out in a Happy Meal and delivers a feature work where voices are added to live action footage. 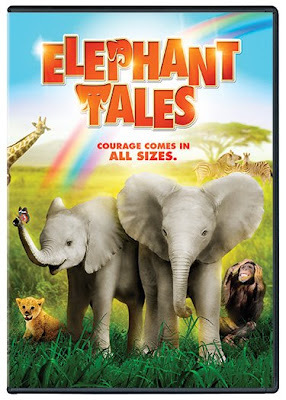 Filmed on location amongst the breathtaking plains of Africa by the talented French cinematographer Jean-Jacques Bouhon-- Tales follows the tale and tails of its elephant protagonists, Zef and Tutu. While it benefits from its authenticity in bringing the gorgeous surroundings of Africa and unprecedented live-action footage of animals in the wild to its target demographic of young viewers, ultimately its success is mixed as it struggles to balance the National Geographic, Animal Planet, or Discovery Channel approach with a compelling storyline that moves much too slowly to garner the impatient attention spans of the typical G-rated audience member. Intriguingly avoiding the obvious choice of adding famous celebrity voices or pop culture references that have become the norm in animal films made for children-- Elephant Tales is fascinating on a visual and filmic level but quickly loses us with its unsuccessful sync between the real animal footage and the added voices that never fully manages to make us suspend our disbelief enough to buy into it or become interested in the sluggishly paced narrative. Taking a hero's journey approach in its family friendly adventure of two courageous brothers who journey to rescue their mothers from "The Badness" (or Zef's name for the hunters), predictably the elephants meet some new friends and comic relief along the way including an amusing chimp named Chump who continually boasts about his "superior mind," a teasing giraffe dubbed Stretch and the aptly named Cub. While there are humans involved in the film including the amoral hunters and the locals from the African community who dance and sing in celebration as the animals pass, ultimately it's the elephant's tale all the way. And of course, while the director and cinematographer triumph in their incredible depiction of animals in the wild and I can't even begin to express how impressed and amazed I was with what must have taken an extraordinary amount of patience and coordinated animal training, sadly the film never quite works. This can be especially attributed to the way it's bogged down by its simplistic dialogue and odd forays into musical numbers that seemed indicative of first Dixie Jazz and then Broadway as the film's soundtrack overwhelmed the audio and washed out the voice-work. Still, it's a great alternative to a trip to the zoo for a kid who's at home sick here during flu season and a wonderful inexpensive version of an African safari given a beautiful transfer to DVD in its dual-layer full and widescreen presentation from MGM and 20th Century Fox but overall, it's one tale you'll forget as soon as the credits roll.